Approaches to student housing have shifted over the last 10-15 years. In response to the trend of blurring distinctions between spaces and functions, places to socialize, eat, study, and attend class are no longer separate and distinct. Students don’t just study at the library and they don’t just sleep in a dormitory. Additionally, in an era when enrollment decisions are sometimes made on the portfolio of amenities offered, institutions are reconsidering their existing res- and student-life programs as a way to attract and retain students. According to APPA’s findings from Center for Facilities Research survey, residential facilities ranked second in importance during pre-enrollment visits, second only to facilities related to specific majors. 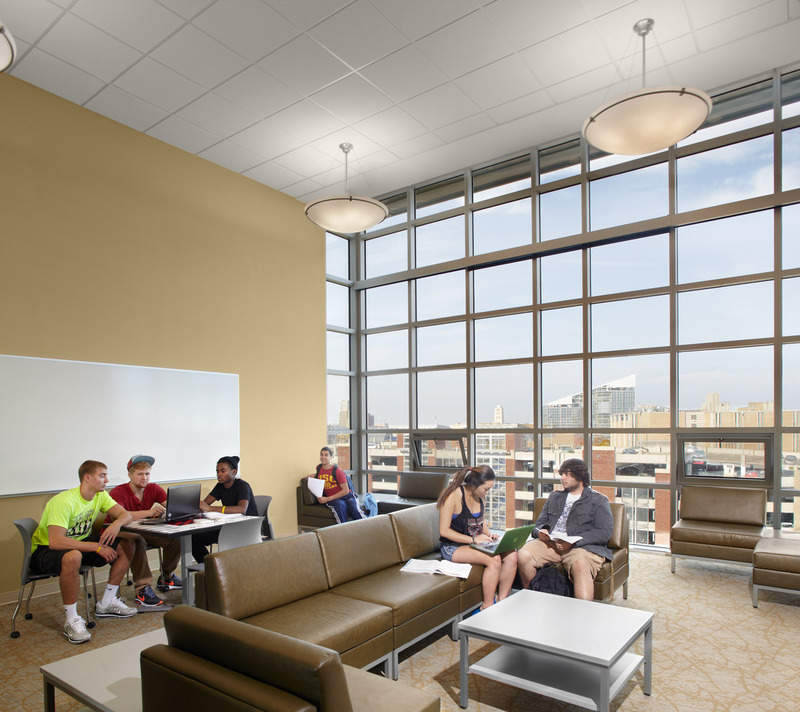 Res-life facilities can be a make or break the ability to attract desirable students and the can play a role in keeping students engaged, connected and satisfied. In order to meet expanding matriculation, the University of Akron teamed with experienced developer Signet to devise a Master Plan for large-scale mixed-use development of the southern area of the campus. 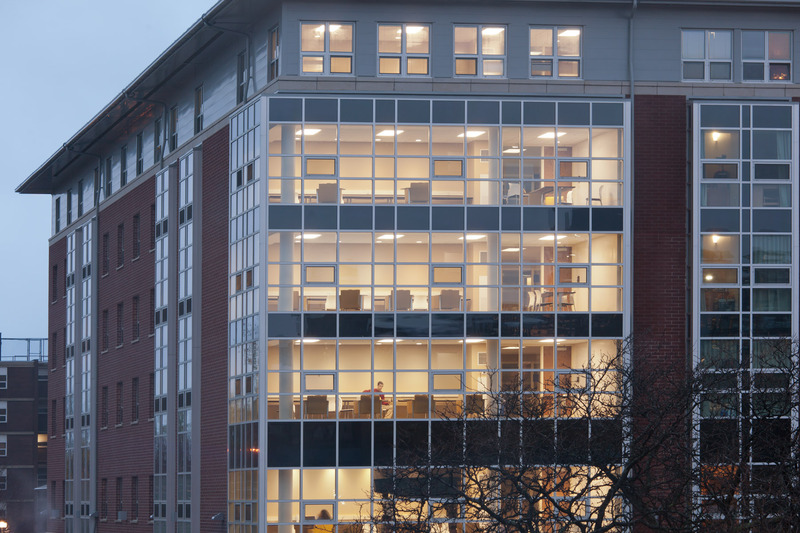 The first phase of this larger project was delivery of the 531-bed South Residence Hall. Signet assisted the University in securing multiple public-private financing alternatives for the project, including a tax-exempt bond financing structure, and arrangements that ensured the University would own the building at the end of a lease term. The University maintained the ability to control all aspects of project design, day-to-day management of the property, and ownership of the land, while fully transferring delivery risk to Signet. The initial study and planning effort had the large-scale goal of developing housing for 10,000 students. JCJ designed Phase 1 - 531 beds in South Hall - in association with Douglas Hyde Design. The design team worked closely with the University to identify the project’s priorities – the range of amenities, mix of room types and objectives regarding student experience. Responsive the the University's adjacent Exchange Street Apartments, the six-story building and green space totals 200,000 square feet. The project is situated on a gently sloping site that required terracing and a compact footprint. The project provides an excellent mix of shared/common spaces as well as an array of specialized living spaces that balance privacy and interaction with others. There are three basic unit types: a single bedroom suite plan complete with living, dining and kitchen; a double occupancy bedroom unit plan; and a plan with two single bedrooms with a common area. Each room style has its own in-suite bathroom, independent temperature control and high speed internet connection. On every floor, there are two Resident Assistant apartments, study and lounge areas, and a free laundry that doubles as a socialization space with comfortable seating areas, televisions and WiFi. Interior layouts, building systems, FF&E, and amenities are designed to be flexible and efficient. Commons, sit-down-dining, grab-and-go, student services, visible administrative offices, and multi-media rooms are located on the first floor. Co-lab/laptop stations, multi-media rooms, hallway niches, wider than normal corridors that can be used for more than just circulation, window seats in small bays at ends of corridors for small group interaction, fitness and health opportunities, floor to ceiling white writing surfaces, strategically located, by elevator, in study lounges, message boards at each student room, gender-neutral bathrooms, and University of Akron symbolism / messaging are located throughout. Outdoor spaces are optimized for gathering.